A couple weeks ago, Justin and I hosted our first Thanksgiving in our new NYC apartment. My mom flew in for the holiday, and we also hosted various friends who did not have a chance to head home. However, I wanted to make sure we also included dishes that were special to our guests. My friends made several suggestions, including macaroni and cheese. Feeling like we already had enough side dishes to go with dinner, I decided to turn the idea into an appetizer. A cheesy, breaded, deep fried, glorious appetizer. To make these, you'll need to start with some macaroni and cheese that has cooled in the fridge. 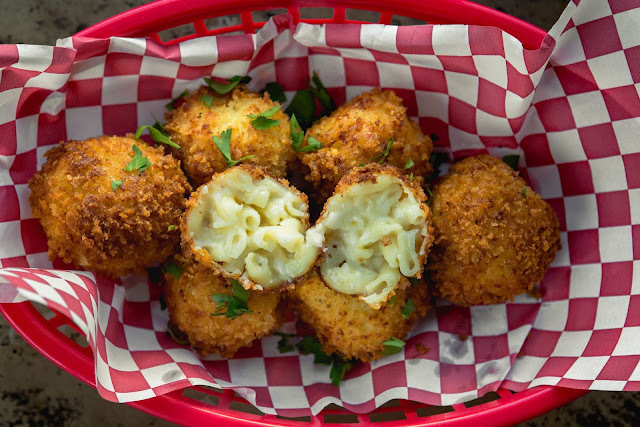 I would say just use leftover mac 'n cheese... but let's be honest... who actually has leftovers when it comes to mac 'n cheese? You are totally welcome to use the store bought kind or make some out of a box. But being the over achiever that I am, I of course made some homemade, loosely using this recipe (minus the pancetta and jalapeños... Though both would've been excellent to leave in, we had a vegetarian joining us for dinner so I just kept it simple.) 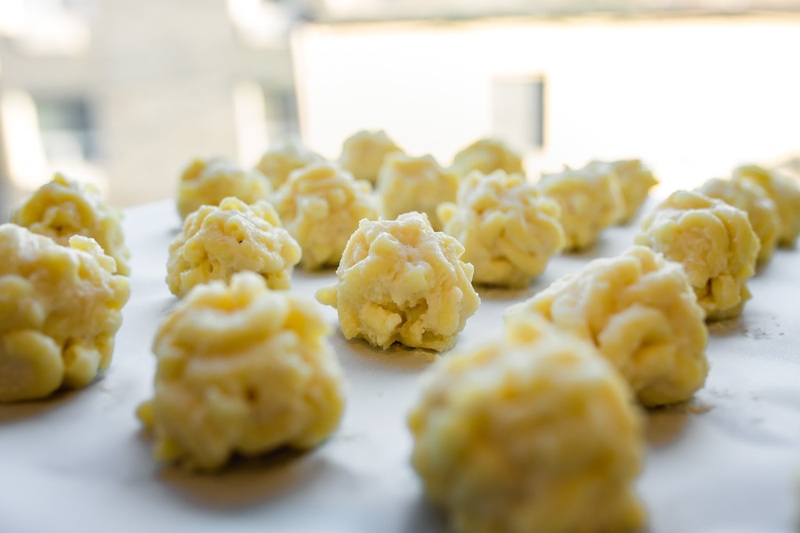 Roll the refrigerated macaroni and cheese into small balls and place on a pan lined with parchment paper. Place in the freezer for at least two hours or overnight. 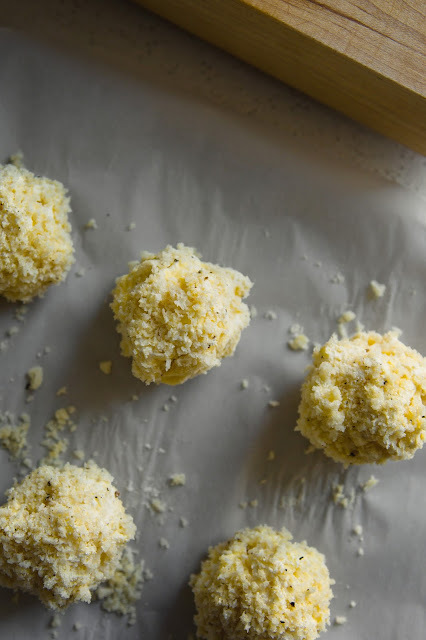 Once frozen, dunk the mac 'n cheese balls into an egg wash and then into a mixture of seasoned bread crumbs and grated Parmesan. While I love my ridiculous breading trays I bought specifically for things like this, I think good ol' fashioned bowls actually work the best in this instance because of the spherical shape. 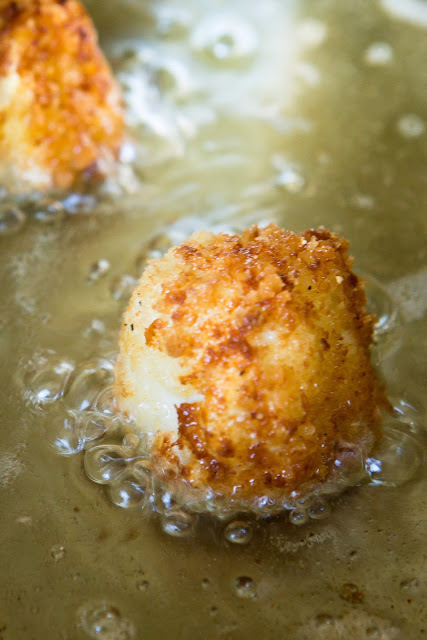 Once breaded, place on a parchment lined pan and put them back in the freezer until you are ready to fry them. 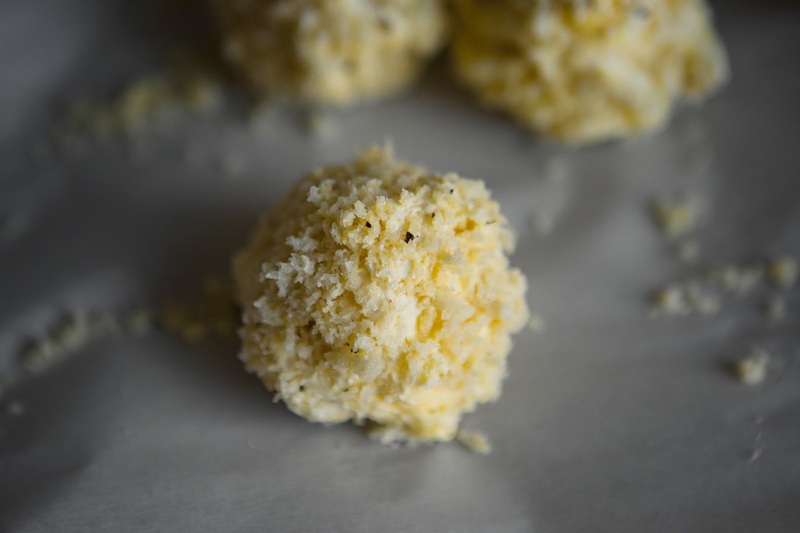 If you want to prep these ahead of time, you can actually freeze them overnight at this point. 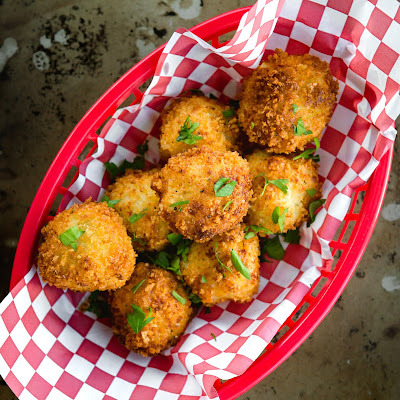 We didn't make all of them on Thanksgiving, so I froze them and fried them the next day for this blog post. When you are ready to serve them, heat some oil to 350 degrees (I like Safflower oil), and fry in batches until golden brown on all sides. 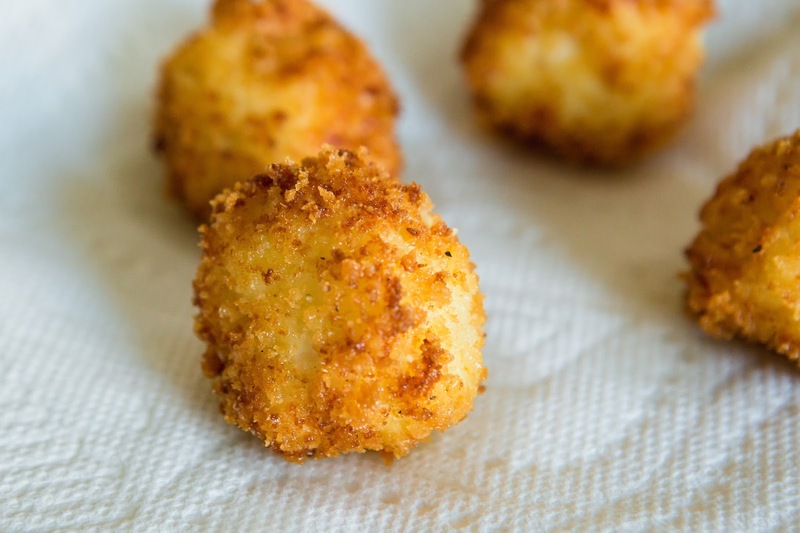 Once golden brown, drain on paper towels and serve immediately. If you want to get fancy, you can even top with some fresh herbs such as parsley or chives. You could also serve with a dipping sauce such as marinara, but we ate them plain and they were a huge hit during the appetizer portion of our Thanksgiving food marathon. 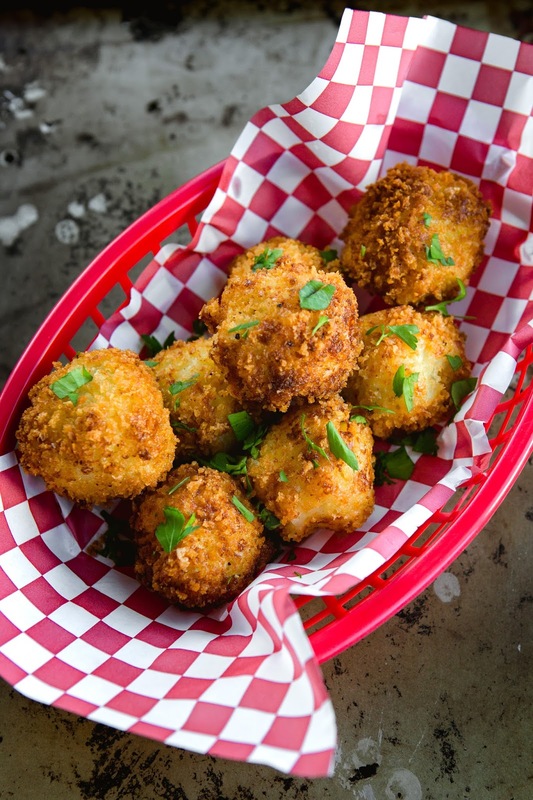 Cheesy, breaded, deep fried goodness. 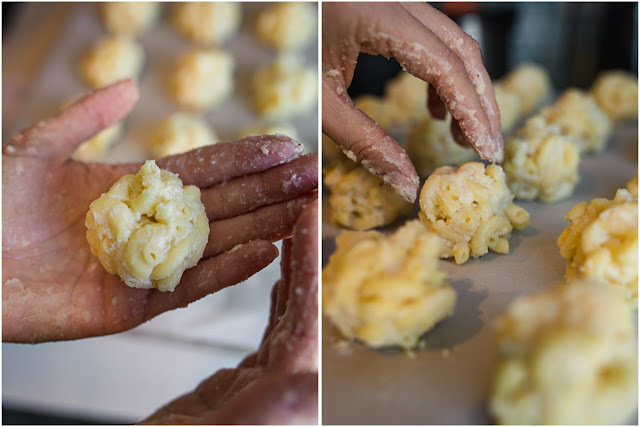 Form the cold macaroni and cheese into uniform balls and place on a parchment lined baking sheet. Place in the freezer for at least 2 hours or overnight. 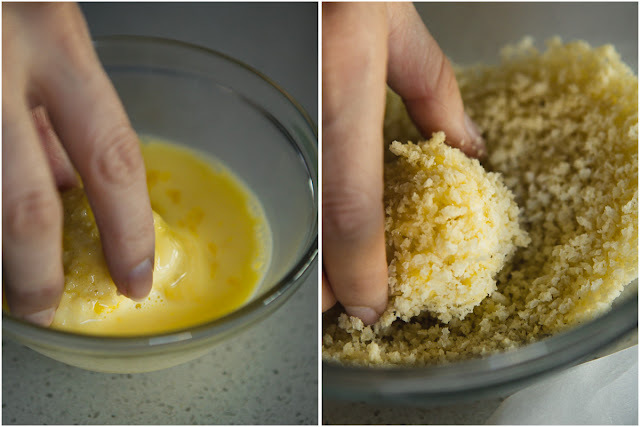 Prepare an egg wash by whisking together 2 large eggs and the milk. Mix together the breadcrumbs, Parmesan cheese, paprika, oregano, cayenne and season well with salt & pepper. Coat frozen macaroni balls in the egg wash and then the breadcrumbs. Place on a parchment-lined baking sheet and transfer to the freezer until ready to fry. 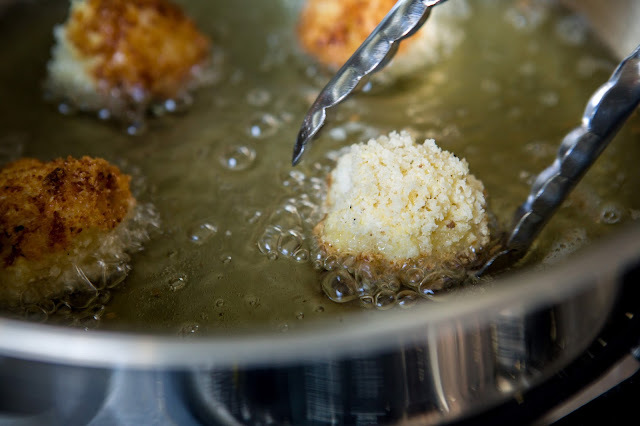 When you are ready to serve, heat at least an inch of oil in a pot to 350 degrees F. Fry the balls in batches, turning if necessary until they are golden brown on all sides. Drain on paper towels and serve immediately.